Human chorionic gonadotropin, or HCG, is a hormone that has been shown to help increase testosterone levels in males, support female ovulation and help undescended testicles in young males descend. This versatile hormone is often used by individuals following a testosterone cycle because of its influence on stimulating natural testosterone production. HCG works by stimulating the pituitary gland to release the hormones FSH and LH. These hormones travel to the testicles to stimulate certain cells to begin testosterone production. HCG can only be given via injection. Consult your primary care physician about getting a prescription for HCG. He will order a blood draw to determine your current testosterone levels. From there, he might prescribe you HCG or testosterone, depending on your blood levels. 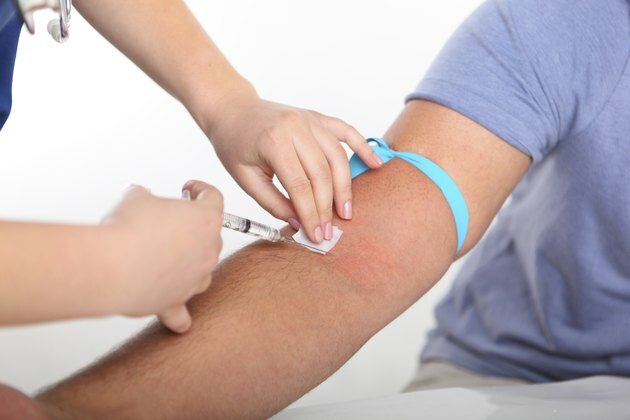 Practice safe sterilizing techniques when you perform injections. These include, but are not limited to, sterilizing the injection site with an alcohol wipe and using a sterilized needle, among other protocols. HCG can only be given via intramuscular or subcutaneous injections. Inject the proper amount. This varies based on the individual, but is generally 2,500 to 10,000 international units, or IU, per week. Store unused HCG in the refrigerator until it can be used. It is recommended to throw HCG away if it is in the refrigerator unused for more than 30 days. Use for as long as directed by your physician. Researcher William Llewellyn says your body will not be as receptive to HCG after about 20 days of use, though one study published in "Postgraduate Medical Journal" had a male use HCG for three months straight. Llewellyn recommends that if you are taking HCG after a testosterone cycle, you also should use the medications Nolvadex and Clomid to help reduce the amount of estrogen in your body. This will also help normalize hormone levels. Purchasing HCG without a prescription is illegal and might carry criminal penalties. What is the Average FTM Testosterone Injection?